An art-deco cinema left derelict for 19 years is reopening after a community campaign to save it from demolition. About £1m was raised in three months to allow a consortium led by James Hannaway to buy the former Odeon cinema in St Albans, Hertfordshire. 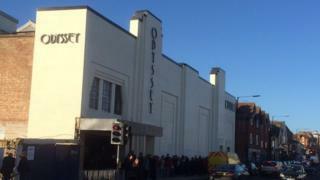 Hundreds of people queued for tickets to Saturday's opening of the newly-named Odyssey. A spokeswoman said there had been "huge interest and excitement". The former Odeon in London Road is the second cinema Mr Hannaway has saved after restoring The Rex in Berkhamsted, which reopened in 2004 following its 1988 closure. In November 2009, he announced his intention to buy the four-screen St Albans' cinema, which closed in 1995, if he could raise £1m. Local people raised the cash in three months. An extra £2m needed to turn the site into a 500-seat, single screen theatre, with seating and tables on the lower level and a balcony above, was raised by buying shares, advance booking membership, sponsoring seats, donations or small loans. Its new name is inspired by 2001: A Space Odyssey, the science-fiction epic from director Stanley Kubrick, who lived in the city. Jill Leslie, who has been involved with the project for three years, said the building was a "really important part of the history of St Albans". The cinema reopens on Saturday afternoon with a singalong screening of Frozen and is followed in the evening by The Theory of Everything, a biopic of Stephen Hawking.